Click here for available wood carved animals. 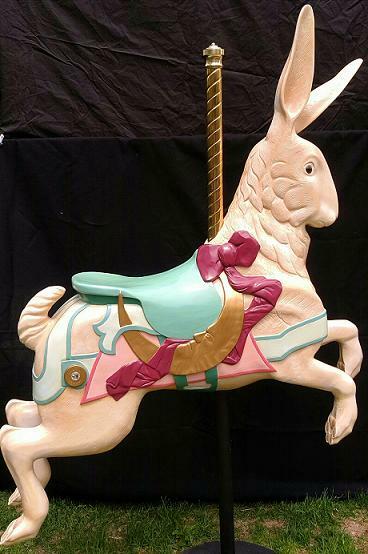 Full size carousel rabbit: 53" long x 12" wide and on a 6 feet high stand; weight 115 lbs. Carved by Elizabeth and Phil Lower in 1993 from poplar wood - glass eyes, mirrored backed jewels, brass pole, finial and a custom made stand. 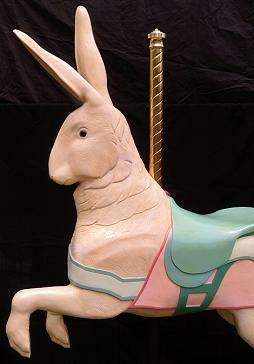 This is a full size outer row rabbit and has been on display at Bruce Johnsons gallery. Some yellowing due to aged patina.